The Christmas season is here with us! It is a great time to get in touch with great Christmas tunes. 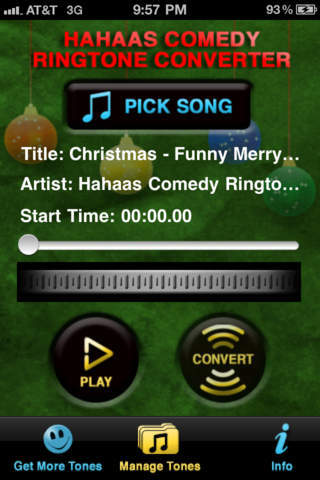 Good news is that you can now download Christmas ringtone apps. Gone are the days when you would have to take time searching for your favorite tunes all over the net. 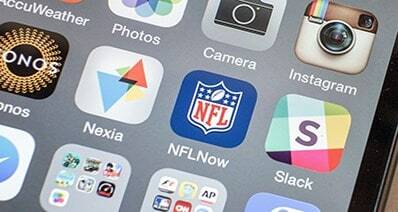 These apps are both paid and free. the free apps are as good as the paid ones in most cases. 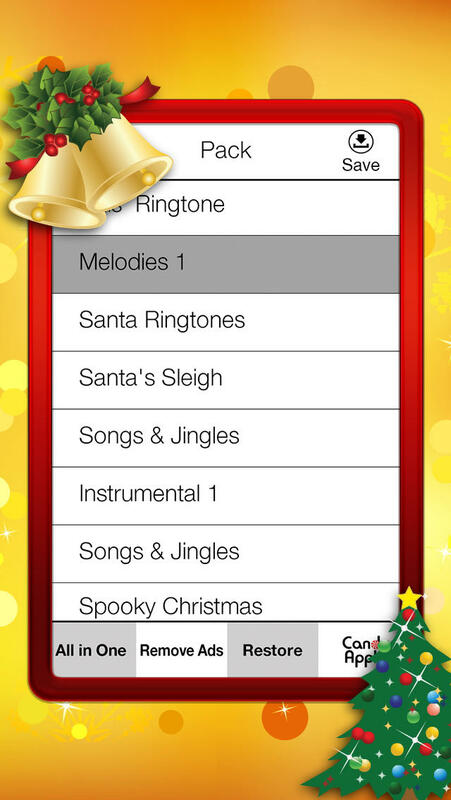 You can now get the whole collection with free Christmas Ringtones Apps for iPhone. 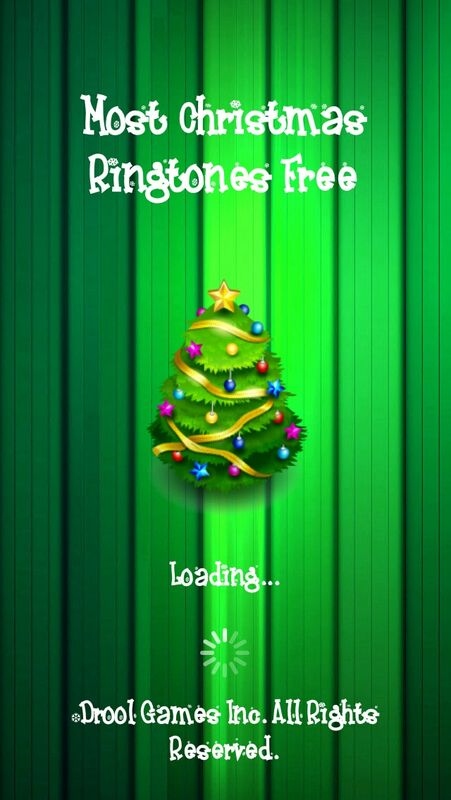 Christmas Ringtones Apps allow you to send and install ringtones that you can use or hare with friends during the festive season. 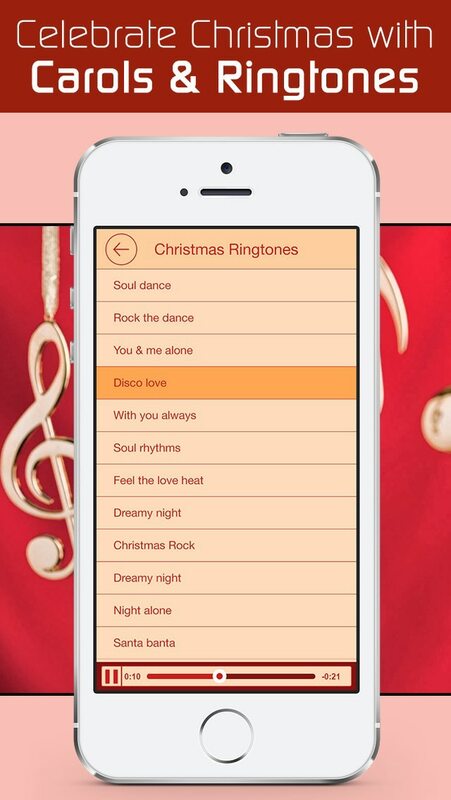 Here are top 20 free Christmas ringtones apps you can install for great tunes this season. 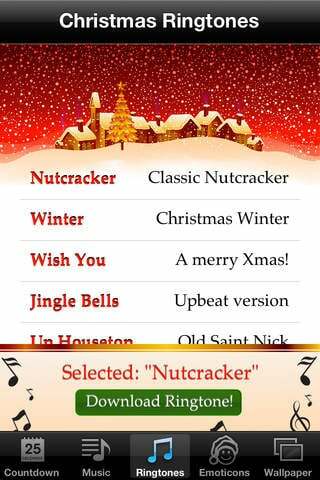 This is a great app if you are a fan of the traditional Christmas jingles. You will be able to download and preview your songs fast and easy. It is however not the best if you are looking for more modern Christmas jingles. The best part of it is that it is free. The pro version is known as Jingles. You will however need to pay for the pro version. It is however a good app if you need a blast from the traditional Christmas days. This is an awesome app for the kids. You will definitely need an app that is all about the season. This includes lots of laughter at the end of the day. Its one gives you more than Christmas ringtones. 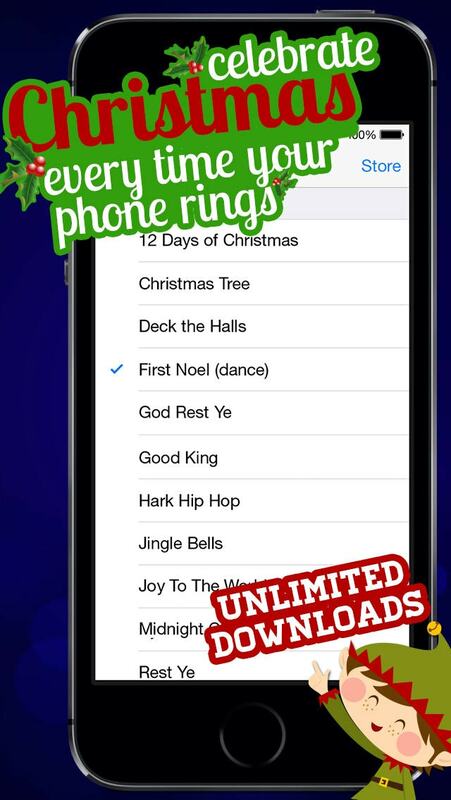 With over 4000 ringtones in the database, you will also get to enjoy over 1000 Christmas tunes. The app also allows you to download any other ringtone you may fancy this season. The app is fast and easy to download. This is one app that you can use for pranks and for almost every mood you are in. This is a great ringtone app for this Christmas. The app allows you to not only download great tunes but also make your own. It comes with more tan half a million ringtones for your iPhone. Can you handle it? The app is also laden with lots of funny music making it a must have for family time. You can now share and pass laughter all around your friends and family at the click of a button. Downloading it is easy and most of all free. Textones are available making it more versatile than most. This is an awesome way to get your hone ready for Christmas. This app comes with great features including creating your own emoticons and Christmas backgrounds. You can use your own pictures to create Christmas backgrounds and send them to friends along with great array of music. The Christmas tunes are a sweet mix of the modern and traditional making them idea for any age. There is no better way to set the Christmas mood when it comes to Christmas apps. The ringtones are also multicultural. This means that you will be able to enjoy your Christmas tones in any language you fancy. The best part of this is that it is a free app: simply install and enjoy. 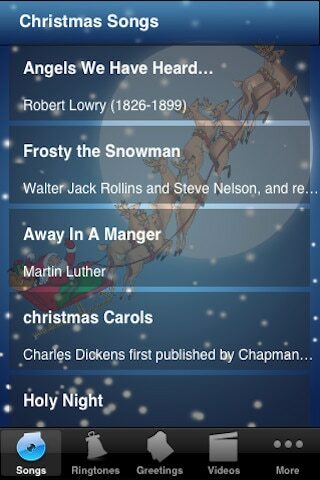 This is a great app if you are looking for precise Christmas music. It does not come with a huge list though. You will however get what you want since most modern ringtones are available. The app comes with great themes for your hone adding to its value. The 40+ tunes are high quality compared to most apps. The tunes are all appropriate fro adults and children. These are also great for sharing with family and friends this season. This app is awesome for a number of reasons. It comes with the most download Christmas tunes form around the world. This means that it will sift for you the best. The beautiful app comes with more features you can savor. 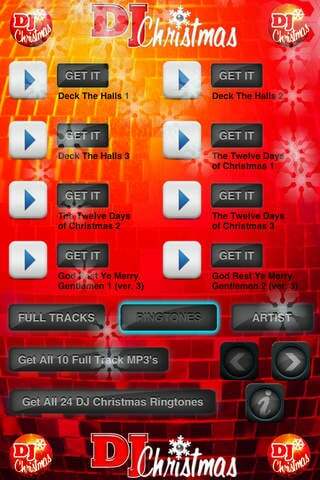 You will enjoy Christmas themes that come with Christmas buttons, the ability to customize your ringtones, a textone and best of all it is free. You will enjoy reminders and alerts through the app making it more than a Christmas app for you to enjoy. This is a must-have app this season. This free app will definitely add color and style to your phone. It comes with a great collection of Christmas ringtones that will be a delight this season. 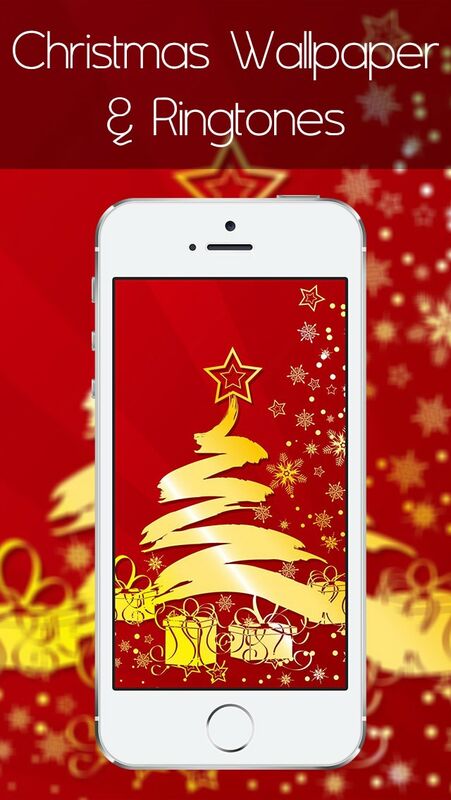 You will also get to enjoy great Christmas wallpapers, photo editor and games. The app does not have a download limit making it a must have. It also allows you to share your music and fun on social media making it very versatile. The app is fast and easy to download too. This is an awesome free ringtone app with lots of features. You will get to enjoy high quality Christmas tunes that can double up as your ringtones. One of the best features of this app is that you can use it offline. The interface is also beautifully designed making it a welcome addition to your phone screen. 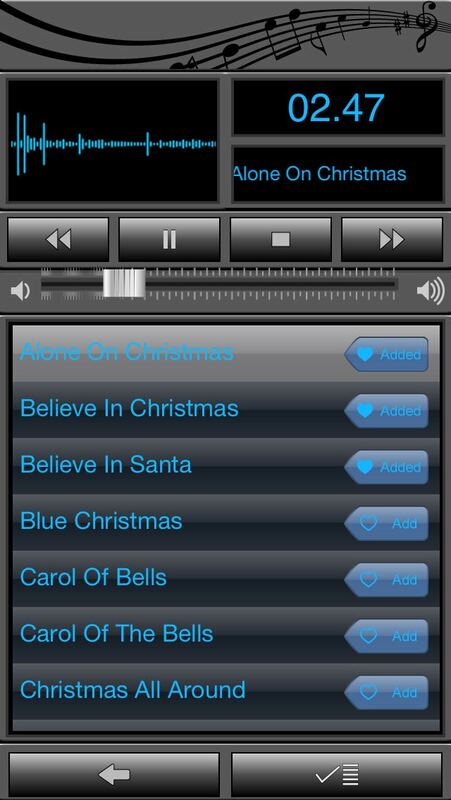 The app comes with a number of Christmas music categories that you can choose form making it easy for you to navigate. The video tutorials make it bliss to use at the end of the day. This is a free app with lots of capabilities that make it fun t use. It comes with great Christmas tunes that can be downloaded anytime. 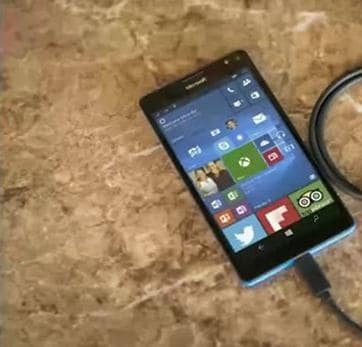 These tunes can be easy set up as ringtones and shared via social media with friends. There is no better way to share the merriment this season. The app has a friendly interface that does not need any tutorial to use. 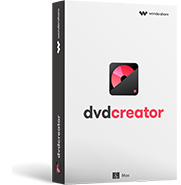 Installation is fast and easy. Enjoy this free app with unlimited ringtones to choose form. You can easily create and convert you own ringtones this Christmas making it one of the best. The Christmas app comes with preloaded tunes known as hahaas. The app also allow you to play, manage and even email unlimited ringtones to your friends and family. 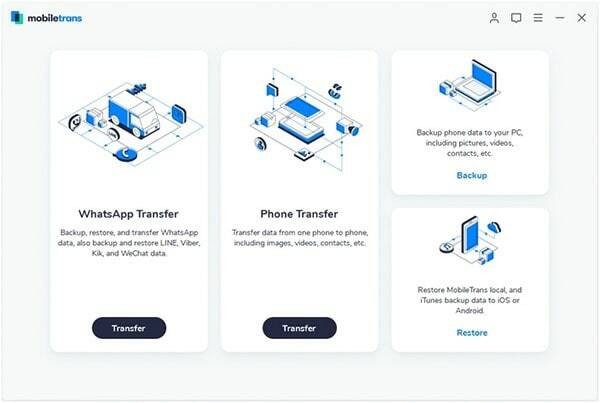 You can also transfer all your ringtones at once thanks to file sharing properties. The app will also work on a number of platforms including m4a, mp3, wav, aiff and many more. The features also allow for precise editing creating some of the best ringtones. This one app does more than download Christmas tunes. You will however be able to download some of the best carol on your phone fast. The app also comes with great backgrounds. You can share your music with friends using a simple interface. You will also enjoy the ability to personalize all your photos using the photo editor and send it to friends. This is an awesome app if you are looking for something easy to use. The tunes are fast and easy to download. They are also easy to share with friends and family. The cool interface is a welcome addition to your phone. This is a free app that is easy to use. It is also perfect if you are looking for something that will not require a lot of navigation and studying to master. The interface is simple making it appropriate for all ages. It also comes with a collection of some amazing carols that you can sing along to. They also make for great ringtones that you can easily share with friends and family. 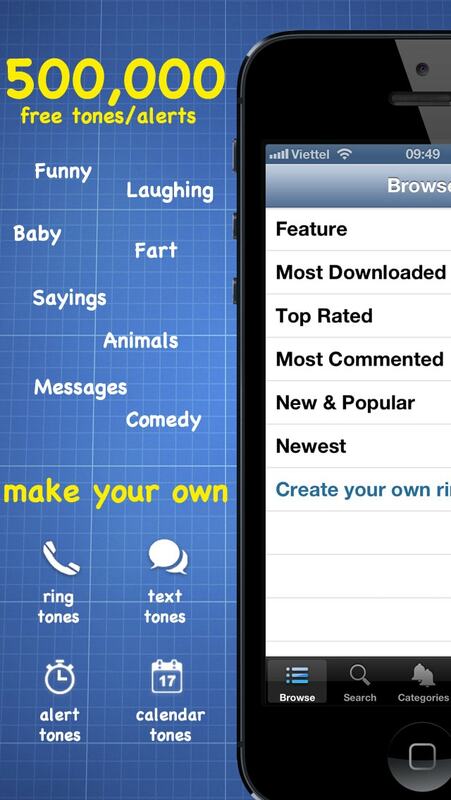 The free app allows you to create our own ringtones easily. It comes with a friendly UI allowing individual of any age to interact with it. The 48+ Christmas songs are a great addition allowing you to have a different ringtone everyday during the season. The app also comes with press and hold icon adding some color and beauty to your screen. This is great app if you wish to celebrate Christmas all through the year. This app has been created uniquely to simply enjoy music. It comes with beautiful Christmas carols along with other holiday tunes. It comes with an easy interface. This means that it is easily used by individuals of any age. 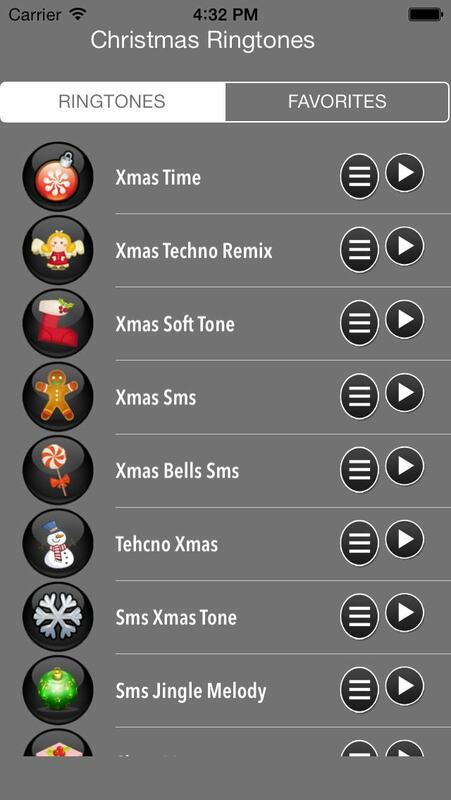 The tunes can be easily set as ringtones for the purpose of creating a festive phone. These can be downloaded and shared with friends and family all year. This is a great app if you are looking for amazing music. The music is also of a high quality making it a must have this festive season. The collection can be downloaded and shared with friends. it is also easy to use making it a fun app from friends and family. The unlimited collection is also a great way to impress especially if you are looking forward to doing some of the songs with your family. The app is free making it ideal for the festivities. This is a great app especially if you are working this Christmas season. It is a great way to let off some steam thanks to some of the most outrageous Christmas ringtones out there. The collection comes form some of the funniest movies. it is however not appropriate for all ages. The tones can be shared with close friends that get the joke. The tunes include get a real job, Christmas balls and Santa Prancer. You will definitely get a crack out of this one! The app is free and easy to use. This simple app comes with a good collection of Christmas carols. You can easily share it with friends wishing them the best for the season. The app is free and very simple to use. It is appropriate for all ages. This is an awesome app if you are looking for some of the best Christmas music there is. The music is remixed and well organized allowing you to be your own DJ. Are you a fan of Techno, hiphop, jazz or Rnb. There is no limit when it comes to DJ Christmas. This is an exciting way to make get the party going without changing the holiday theme. You will be able to enjoy the music in all styles including hip hop to slower paced music. The ringtone are unique and a definite way to impress friends. The tracks can be used in batches allowing you to come up with the best works of art to share. This is a great way to set your iPhone up for Christmas. 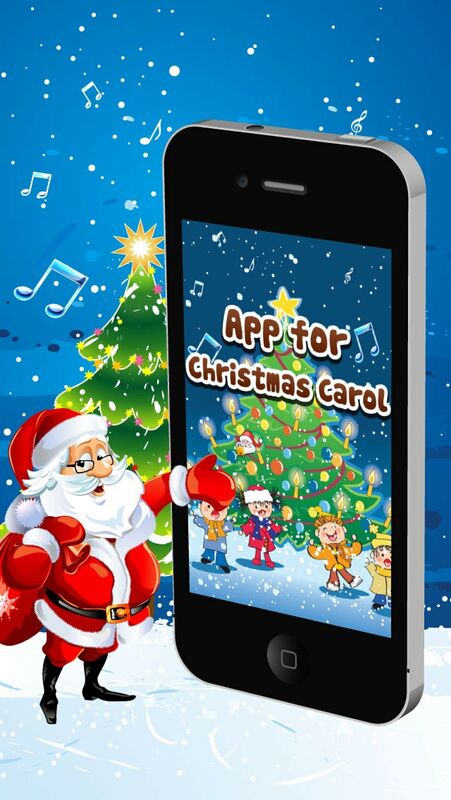 The app comes with a beautiful collection of Christmas carols that are great for family. You will also be able to share this with your friends. The app also provides more than ringtones to impress your friends. You can enjoy games and set up wallpapers to pass time. The beautifully designed interface is a good addition to your home screen. The app finally comes with Christmas radio allowing you to get access to all your Christmas music and news fast and easy. What better way to enjoy this season. 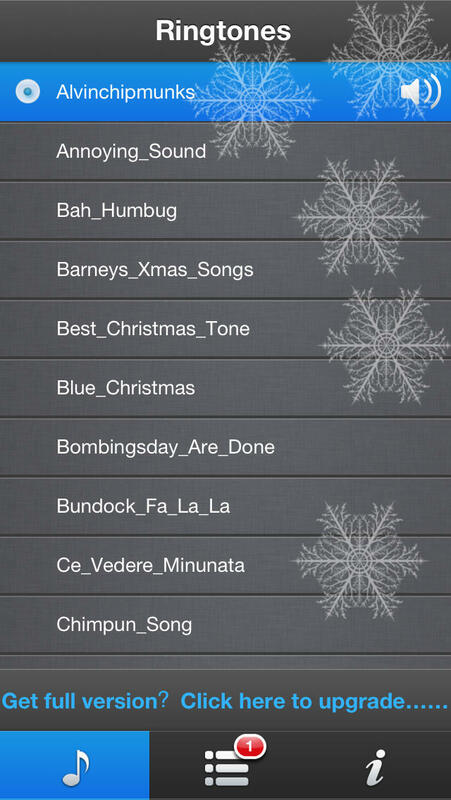 All these free Christmas ringtones apps are a great way to enjoy Christmas this season. Merry Christmas!